If you’re creating a Squarespace site for your job search or personal brand, you might want to add your resume to make it accessible to potential employers, contacts, and clients. This guide covers various options for adding a resume to your site. You can add it to a Text Block, make it a downloadable file, and/or embed it as a .pdf. Tip: To give your resume its own link in your navigation menu, add a page to your navigation and use the following steps to add the resume's content to the new page. Alternatively, you may want to add it to an "About" or "Bio" page. For a straightforward approach that matches your site's design and may help with SEO, add the text in your resume to a Text Block. Open a page or post editor. Click an Insert Point and select Text from the Block Menu. If you're copying and pasting from another source, paste it as plain text to avoid formatting issues. For help with this, visit Fixing text formatting. Cómo usar Encabezado 1 o Encabezado 2 para tus cargos anteriores y otra información esencial. Esto ayuda a que estas palabras clave se destaquen para los motores de búsqueda, lo que facilita que los posibles empleadores te encuentren. Use numbered and bulleted lists to organize your information. To learn more visit Using the Text Block - Format text. You can include your resume as a .doc or .pdf file with a text link. This lets visitors download your resume or view it in their browser in its original layout. Enter text like "Click here to download my resume." Highlight the text and click the Link icon in the Text Toolbar. 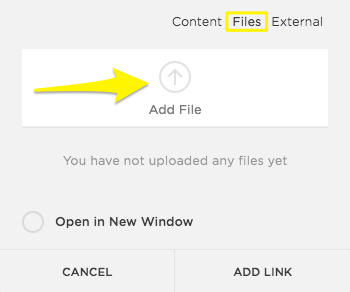 Select Files and drag your resume into the file uploader. To learn more, visit Creating a text link. Note: File uploads must be 20 MB or smaller. 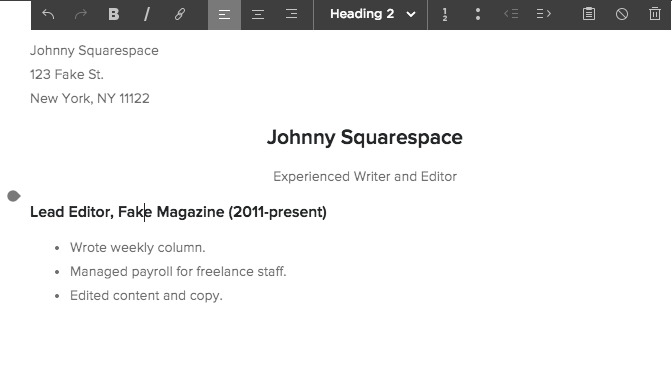 You can use the third-party service Issuu to embed your resume on your site as a .pdf. This is a great option for resumes with elaborate designs or layouts. To learn more, visit Using Issuu with Squarespace. Note: Embedded .pdfs aren't indexable by search engines. If you'd like your resume to appear in search results, we recommend both adding it to a Text Block and embedding it as a .pdf. Rather than creating a single resume page, you might want your entire site to act as your resume. While a full portfolio site often includes a resume page, but focuses on showing work examples, a resume website is a single page potential employers can scroll down to read all your information. For a short resume, consider using a single Cover Page on your site. Cover Pages have eye-catching layouts that showcase a short amount of text. There are several layouts designed for creating profiles, including the Vignette layout, shown below. For a longer resume, you could create a site with a single Layout Page and use the Text Block method described above. Or, to add more design flair, consider using a stacked Index Page to create a single page with multiple sections. To see this in action, visit the Pursuit demo site. If you like this look, you can start a site with the Pursuit template and replace the demo text with your own content. If you've already started a site with a different template, switch to Pursuit. Its demo pages and style settings will be added to your site. Connect to LinkedIn to display a LinkedIn social icon, push content to LinkedIn, and more. Encourage potential clients and employers to contact you by creating a Contact page with a customizable form and other information.